To be fair, its been a while since I stacked at all... let alone a bad one. But on 14th I came head first onto the road and 45kmh and have no recollection of anything much from the day at all. I told the ambulance men there was a cat on the road that I had to avoid, and I do remember seeing an animal run out, but most of it is a bit blank. In terms of injury I was confined to a spine board and neck collar for 6 hours whilst having x-rays and brain scans. My helmet saved me the Doctors said. cuts on head/neck/elbow and knee. My Garmin data shows no change in my heart rate so I am confident I didn't black out and all the machines I was wired too for the hours after reported no chance. 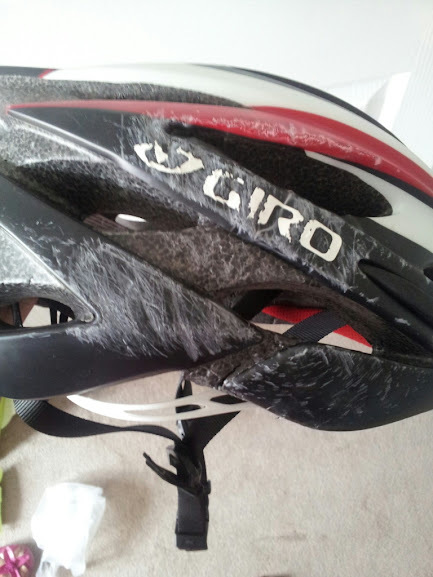 I never even ride to the shop without my lid on and feeling the huge bump on my head when the paramedic cut the Giro off me made me think how bad it would have been without the helmet. Going to be a few weeks/months before I get the movement in my hip and knee back. My bike is in the repair shop now, so we will see the final cost but the bars and forks aren't looking good. Jesus mate, sorry to hear that. That sounds like you had a close call! Best wishes for your recovery, I hope you have no lasting injuries. I never ride anywhere without helmet either, it just makes me feel safer. I crashed in a similar way last year, in early July. Possibly even more than 45 km/h (it was down the Ofenpass, about 9%), but I can remember everything from the day (except a phone call I allegedly made to my parents after the OP, was still on the good medication). Went over the handlebars, bike made a somersault over me. Cut on the left eyebrow (expertly handled by the Swiss, almost invisible now), minor bruising on arm and leg, a rather deep wound on the right ankle (from the front wheel spokes, probably) - and a broken collarbone. The helmet took much of the impact as well, I don't think I'd be here now without a helmet. Spent three months with a piece of titanium in my body, started riding again after 1,5 months. Went down to Limburg in September and rode my bike for 8 days straight without problems (with the titanium still in there); and now I'm as good as new. Sorry to hear that, Jimble, but really glad you're OK enough to have told us about it here. Wishing you the very best and a speedy recovery, dude! I went down, on my side. Didn't think I'd hit my head until somebody told me that I kept repeating myself (classic sign of concussion). Took my helmet off straight away and sure enough it was cracked. I suspect that no helmet that day would have put me in hospital. best wishes for your recovery Jimmy. And yes people, always wear a helmet. Glad your okay, heal up fast, I wish you the best on getting back to riding. From experience I can tell you it's likely it will take some time to recover fully mentally. Earlier this year on a group ride I was sprinting with another rider for a stop ahead sign, then the next thing I remember is waking up on the side of the road not remembering what had happened. Apparently I had gone over my handlebars (I suspect the cause being a broken cleat and my foot coming out of the pedal) and upon impact my helmet had somehow come off my head. I ended up with in addition to cuts and bruises a minor concussion, a small laceration to my liver, as well as having to get some stitches above my eye where I hit the ground. Was off the bike 2 weeks myself but even more important then recovering during those 2 weeks was recovering mentally. And getting back to a point where I felt comfortable riding again. On the group rides I did once able to ride again I stayed completely out of all the sprints and when I did decide to get in a sprint again I just did it from a seated position. But I managed to return mentally and get back to my normal riding level. So when you do start riding again, it's perfectly normal that you may not feel as comfortable and controlled on the bike as you did before the crash. But just hang in there. It will take some time, but you'll get back to your old level with time. I often feel the mental side of cycling is the hardest side. Nothing feels worse than not feeling the same on the bike after a crash, or not being able to deliver in a race, or struggling to make a return to your old level. And pushing forward after these kinds of setbacks can be very difficult. I've had to find the motivation to continue and push past those kinds of setbacks more than once this year in my own racing. It's hard coming back mentally, but as long as you have the motivation to do so and are patient, you can get there. Last winter I had the misfortune to see what head trauma can reduce people to. Stuff you read about, but a frightening experience to see in someone you care about. And that was from slipping over wet leaves at probably 12km/h tops. Since then, whenever I hear someone even mentioning a head injury they walked away from.. man, it's good to hear you walked away from it, and it's still you Jimmy. For you and those who care about you. Hope the other bits recover soon too, and that getting back on the bike will be just like it was before. Sooner rather than later. But don't rush it. Nothing as important as giving the head time to heal its wounds too, visible or not. And sometimes that is longer than you want it to be, or expect it to be. For the first few days I was done with cycling and someone on here was likely to get a bargain Bianchi road and Rose TT bike! Sadly for you all I am now thinking this isnt the right way to finish and that I will be back although might be sportives and not time trials in the future. I want to enjoy my riding. Shame as I have been racing the best I have done for 5 years. Am off to watch the club 10 tonight so hopefully will get a bit of my mojo back and be tempted by a little spell of turbo work to turn my legs. Shiiiite, bad news indeed mate! Look after yerself... all the best for the recovery! Gotta say, regards helmet use... I never, ever used to train with one (in Europe - always did in Aus) but lately I automatically reach for the 'casque' even if I'm just pottering for an hour in the lanes. The only downside being as I'm getting, er, slightly (ok, ffs, completely...) bald, I get woeful suntan marks on my barnet! Bloody hell Jimmy, get well. Physio says yay so I am off out on the roads tomorrow after a week of boredom on the turbo whilst the sun has been shining. Awesome, Jimble! That was ruddy quick actually. Though I'm sure it felt like an eternity for you! It did indeed feel forever. Am going to ride a time trial Weds evening so we will see how that goes. 26m11s for the 10 miles (or 16km). I kept under my max HR and enjoyed the sunshine ! Good time, Jimski! So how does that compare to times achieved by your "unbroken" self? About a minute slower... so not lost too much in a month off. but here is my review of the year with more about coming back from a crash. Perhaps easy to say for me as this is my second nature - did the sport from 4 years old onwards - but to know how to fall is important as hell, certainly when you are riding at 20/30 mph. not alone is coming down in the UK at the moment http://road.cc/content/forum/100172-it-me-or-are-roads-super-slippy-mo lot of it about.